I'm still in love with triangles and have fallen hard for these geo cards by Fremantle, WA-based surface designer Danielle Stewart. I've followed Danielle's design work for years (from her days as a textile designer with her Of Paper And Thread label) and after a short break I'm excited to see Danielle designing again; this time a range of 100% post-consumer recycled greeting cards. 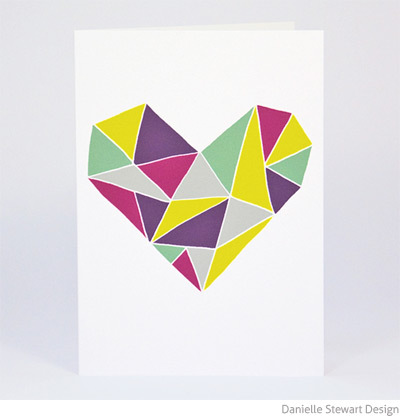 Danielle's colour combos are fresh and her designs are modern and punchy. I can't wait to see what comes next. 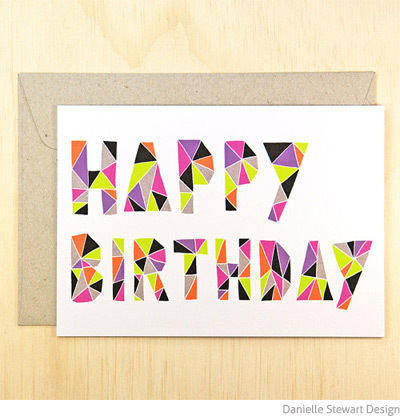 You can find Danielle Stewart Designs greeting cards as well as limited edition screen-printed fabric in her etsy store.